Ended up here at the end of a treasure hunt. The bar man, a friendly chap, asked if we were on the Monopoly crawl. It is a small pub and I would imagine that it does get busy at times, but being late on a Monday night it was quiet. I had some passable Green King IPA. The other ale was Speckled Hen. It is a bit of a trek to the toilet - a disadvantage for a man of my age. Prices are what you'd expect in the city, around �3.30 a pint. I liked this pub. Quaint, warm and welcoming although a bit short on space when a crowd gets in there. But this was no.2 on the monopoly crawl just after spending some time at the elephant & castle, so a welcome change. Reasonable for a station bar though we were sharing the area by the windows with a pigeon. The staff seemed to treat it like a pet. Two ales on - Pride and Youngs.... the Youngs was drinkable the pride wasn't. 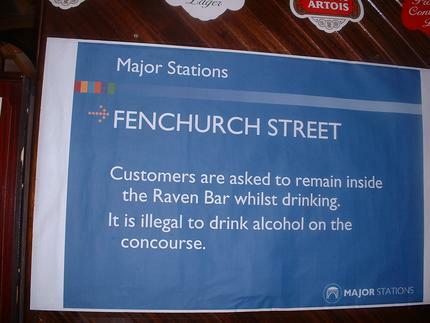 It is however the only bar open on a Saturday afternoon in the Fenchurch Street vicinity. 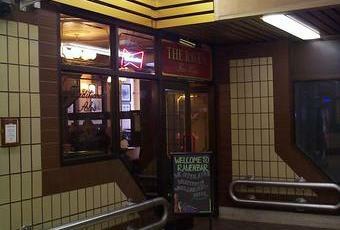 was in here the other saturday and they called last orders at 5pm why ??? ?